Presenting to you a gorgeously elegant tube by GraphFreaks-Enchanted Meadows. Who doesn’t love Unicorns and beautiful Maidens? Enchanted Meadows comes as a single pose that is separate from background. She will grace your PSP tagging library. 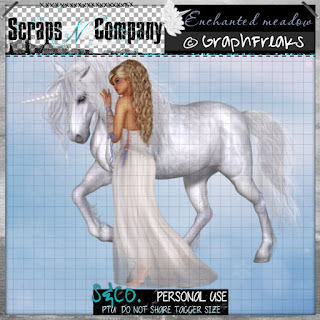 With separate purchase, there is a matching kit also entitled Enchanted Meadows by Disturbed Scraps. This kit comes with 75 Elements, 14 Papers (800 x 800) and a BONUS of 2 Clusters. You can purchase Enchanted Meadow tube HERE. You can purchase the Enchanted Meadow matching tube HERE.